Welcome to the Before & After section of the Suite HOPE website. We are in the process of constructing this section and would love to have Dallas-Fort Worth patients send submissions to us. If you'd like to be photographed for this section, please send a photo and brief paragraph about yourself to info@suitehope.com. We encourage all women who are 18 years of age and older in any stage of treatment or recovery to apply. We invite you to return to this section periodically to view our progress. 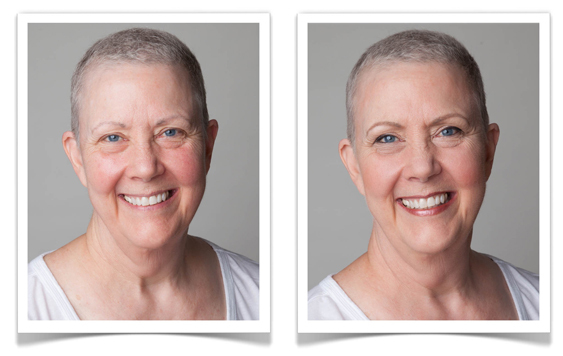 When my friend Glenda Reynolds agreed to be photographed for Suite HOPE, she became the very first person who would appear in our “Before & After” section of the website. Energetic, beautiful, hard-working and a giver, Glenda was diagnosed about a year and a half ago with stomach cancer. On the day of her shoot, Glenda felt well and able to travel. She was grateful she still had the ability to work. When Glenda came to the shoot, she wasn't accustomed to being in front of the camera. As a successful producer for television and film, she was always the one behind it. However, she let Tim and me guide her through the process of establishing our visions and was a complete natural. The thing about Glenda was that she looked so great before we even started hair and make-up. I hesitated to make her up at all. The nature of before and after photos is that one shows the subject without make-up, and the after show shows the subject in all her glamour. Glenda just happened to be so beautiful that the after shot was just a formality. A few months after the shoot, Glenda lost her battle with cancer. These are the images that resulted from her willingness to give back. Glenda is truly missed. I was introduced to Linda through her son Chris Whitten, a talented photographer and friend. I liked Linda right away. She is warm, friendly, easy to talk to and so beautiful. There is something really vibrant about her. Had I not been told, I would not have know she had cancer. That's the thing about cancer, the cancer itself seldom makes you look different, it's the treatment of cancer that does. The very thing that assists you in being well is what points to the fact you are sick. That's where Suite HOPE comes in, our goal and very mission is to help women with the esthetic changes that occur during treatment and beyond. I was lucky enough to have a couple consults and develop a great relationship with her, so much so that I asked her to be photographed for this Before & After section. Watch for Linda and her story in an up coming issue as our feature model and Cover Story. Until then, these are the shots from a great afternoon spent with my new friend Linda and old friend, photographer Tim Boole. Each time I do one of these before and after shots, I fall even more in love with these women. Abigail is no exception. Very much like parents describing the fear that they did not think they could love a second child like they love the first, until the second child is born and then all fear goes away and makes room in your heart for you to fall completely, incomparably, in love. Working with Abigail has been just that kind of experience. I had known and worked with her boyfriend, Stanton Stephens, for several years, so he was a natural fit to shoot these images for both reasons. I traveled to Seattle and so it was the three of us, three friends making images to share with others in hopes of inspiring others on their journey. Here’s a look at the techniques developed to help with the esthetic effects of cancer treatment, The HOPE Method (Helping Oncology Patients Esthetically).